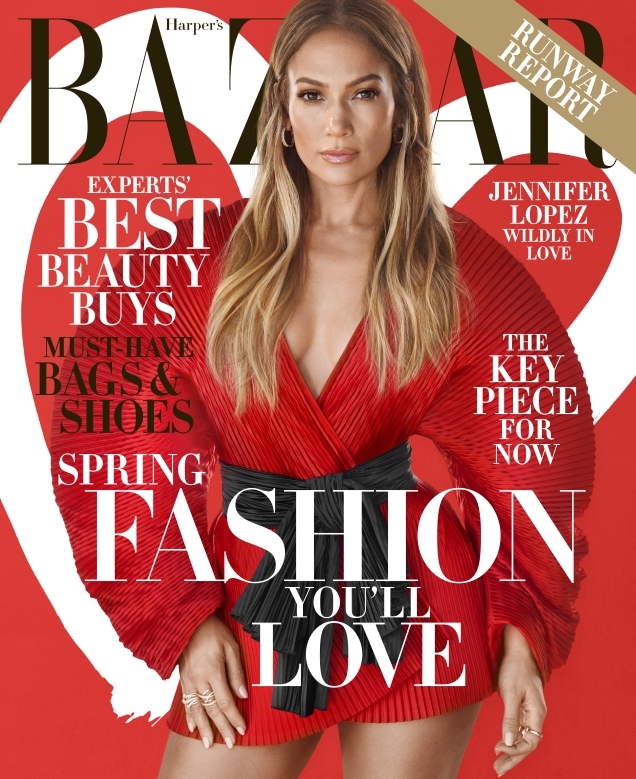 No, your eyes aren’t deceiving you: Jennifer Lopez is back on the cover of American Harper’s Bazaar…not even 12 months after her last appearance. Last year was pretty hit or miss for the glossy: Selena Gomez resembled Kylie Jenner in March, Bruce Springsteen was the disappointing cover star for September and Margot Robbie somehow appeared generic in December, yet the magazine delivered stellar covers featuring Gigi Hadid, Bella Hadid and Julia Roberts. Unfortunately, Bazaar is off to a rocky start for 2019, with a cover that seems recycled from a decade ago. Photographed by Camilla Akrans and styled by Patrick Mackie, J.Lo tries her best to make a red pleated Gucci number look somewhat wearable, all the while giving us flashbacks to the February 2009 cover. Members of our forums were quick to call the magazine out. “Sigh, just when you think this magazine cannot stoop any lower. First, they give JLo a back-to-back cover, then they recycle a February 2009 backdrop? All the tears over Anna [WIntour], but how exactly does Glenda [Bailey] hold down her job?” asked Benn98. “Jennifer looks great but who rehashes an already stupid concept exactly 10 years later?” dodencebt echoed. “Red love hearts for Valentine season? The girls look great but the covers look tacky,” mocked Morgane07. “So BORING, please stop repeating the same pose, same background and the same theme!” pleaded ChicSaks. “JLo looks great but you can hardly see the dress… everything is so red,” KissMiss critiqued. Ouch. Better luck next month Bazaar! See more from JLo’s cover shoot and drop us a comment here.